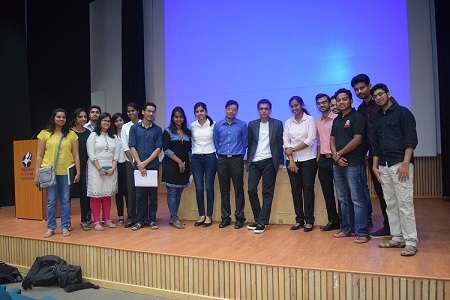 The Industry Interaction Cell of IIM Indore organised a corporate Leadership talk by Mr. Rohan Murty on the topic, ‘From Carbon to Silicon: The Industrialization of the Tech Industry’ on March 4, 2016. Mr. Murty talked about the dramatic transformation of businesses from human resource oriented to technology based structures in the future .He argued that human minds should be reserved for doing creative and thought provoking activities and all the monotony should be left for the machines to handle. He also illustrated the software ‘pacman’ eating many other industries and emphasized that it was time for removing all its inefficiencies through artificial intelligence. 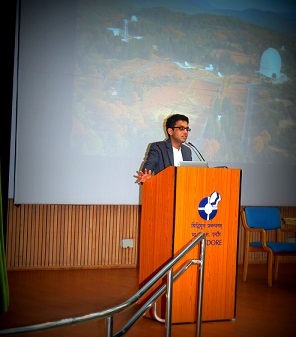 Taking the discussion to a high level of engagement, Mr. Murty narrated various stories of productivity. He shared anecdotes of the 18th century ‘Computers’, who were basically women who used to perform basic algorithmic functions for their employees. He said that not much has changed in that respect. He was of the opinion that human beings should only make new rules and not follow them. Such mechanical and monotonous work of following the rules can be done by machines. He illustrated the human resource intake of the top five tech companies in India and said that in the near future, such demand will fall drastically as technology will take over most jobs. He emphasised that true intelligence is the ability to solve previously unseen problems. He argued that the education system needs to change so as to evolve the mental faculties of the pupils and encourage new innovations. After the corporate leadership talk, he engaged into an interactive Q and A session with the students where he talked about his initiatives like the Murthy Classic library of India and emphasised on the importance of staying close to your culture and roots. He also talked about his investment in Robo-AO, which is said to be the world’s only fully robotic adaptive optics system,and is reportedly 10 times more efficient that the adaptive optics system presently available in the world. In the end, Professor Rishikesha T. Krishnan, Director, IIM Indore congratulated the Industry Interaction Cell for the success of the knowledge building session and thanked Mr. Rohan Murty for his enlightening words. About Mr. Rohan Murty: Mr. Rohan Murty was selected as a Junior Fellow at the Society of Fellows at Harvard in 2013, which has over a dozen Nobel laureates like Mr. Amartya Sen, Mr. Wally Gilbert and Mr. John Bardeen .He is only the second computer scientist to be selected among the society of fellows in its 82 year old history after Marvin Minsky – the father of artificial intelligence.